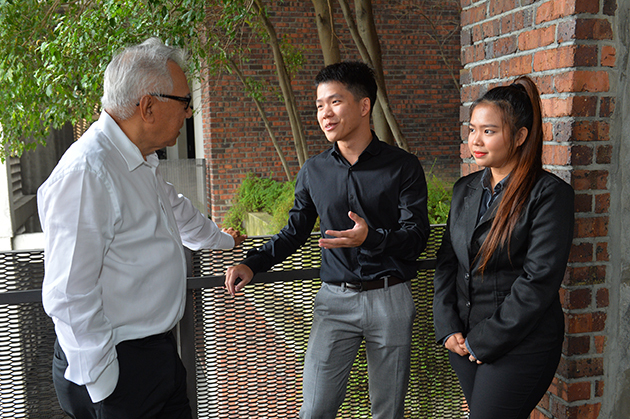 Gamuda Bhd Chairman Datuk Mohammed Hussein (left) speaking to Tan Kwan Yee and Sararossy Sungki Anthony about their future plans. Tan and Sararossy are among the 34 Gamuda Scholarship Award 2018 recipients. KUCHING: In a move to better the lives of students in East Malaysia, the Gamuda Scholarship serves as a talent – building programme which has been sponsoring deserving students nationwide to pursue their undergraduate studies since 1996. An initiative under Yayasan Gamuda, more than 340 scholarships valued at close to RM40 million has been awarded between 1996 and 2017. This year, over 1,800 applications were received and from that, Gamuda shortlisted 34 awardees with total scholarship valued at over RM3.1 million. Students undergo a comprehensive selection process and are required to have excellent academic results; possess a good command of the English language; and display leadership qualities among other attributes. They also undergo assessments like business simulations, workshops and interviews that test their critical thinking ability, analytical skills and business acumen before they are shortlisted for the scholarship. Among the recipients include Sararossy Sungki Anthony, who used to travel to school on a small motorboat with her journey lasting an hour or so. Her mother landed a job as the school matron in SK Ng Selibut, Song, while her father was a teacher there, which provided a chance for Sararossy and her siblings to stay in at the school hostel together with students who hailed from other faraway rural towns. Back at her hometown in Song, there was no progress – the village folks were mostly farmers and fishermen. Therefore, it was only natural that Sararossy dreamed of a career in engineering so that she could bring progress and development to her village. “At school, there was no electricity and the generator would only be turned on from 7am until midnight. After that, it was pitch dark. “Back in Song, there were no proper roads, no tall buildings, no visible signs of development and progress. That is why I decided to pursue civil engineering, to bring betterment to my hometown,” she shared. Sararossy, 22 hopes that when she joins Gamuda after her studies at Universiti Tun Hussein Onn Malaysia, she will be able to do her part in planting the seeds for a rail link similar to the Klang Valley MRT to be implemented in Sarawak. “I know it is not something that can happen anytime soon, but it’s my long-term vision. We are already seeing great improvements brought about by the construction of the Pan Borneo Highway. People in my town are getting jobs in the government and in construction firms. This is one of the real economic benefits that comes out from infrastructure development. ,” she added. Another beneficiary of the scholarship is 20-year-old Tan Kwan Yee from Sibu, who has an ultimate goal in mind. If he had it his way, he’d build a complete rail network that connects the entire Borneo Island. This ambitious vision was a major push factor that inspired his decision to pursue civil engineering at the University of Nottingham, Malaysia. “I wanted to go study in the UK but my parents can’t afford to fully sponsor my studies abroad. This university is my next best option to obtain a UK degree. I find UK degrees very helpful as a lot of our local engineering and innovations are influenced by their country,” said Tan who hails from a middle-class family. “I really hope that whatever knowledge I gain from my studies can help me meet my goals. It is not going to be easy given the socio-economic conditions, geographical challenges and other hurdles but I can always give my best,” said the middle child of 5 siblings, who is always up for challenges. “Those who do not have their own vehicles have two travel options between districts – flights and boats. One can be very expensive while the other can be a very risky mode of transportation. A good rail network is more stable and sustainable when compared to the two,” said Tan. He added that a comprehensive transportation network has great multiplier benefits including boosting the economy, alleviating poverty and transforming lives and that he’d be happy if he could contribute towards this in his own ways. The Gamuda Group is well positioned in the industry to expose students to world-class training and high impact projects that will fast-track their learning and growth. According to Gamuda Bhd chairman Datuk Mohammed Hussein, the Gamuda’s scholarship award is viewed as a long-term commitment aligned to sustaining the growth of the country and moving the local workforce up the value chain. He added that the Group had always kept in mind its role in building the nation. “We believe Gamuda’s ability to sustain our growth must be aligned with our country’s vision of future growth and moving our people up the value chain. We have always aspired to be a substantive contributor to nation building, and we always consider building the country’s future pool of talent as a substantive form of contribution,” Mohammed said. Mohammed added that Gamuda has spent the last four decades building significant infrastructure and townships and that during this time, the Group had gone through several economic downturns that required it to respond and evolve. “We have been able to survive those difficult times and build a strong reputation for coming up with new business opportunities and innovative ways of providing engineering and construction solutions. This has been the key to our resilience as a Group. “Our country is now going through a similar period of change and we have to respond to these changes, so that we can not only survive but continue to prosper. We may have to take a step back sometimes, but evolve and adapt we must, so that we can continue to provide business and job opportunities for our fellow Malaysians. “I say fellow Malaysians because the majority of the businesses that we support are local businesses and the majority of our talent resources are Malaysians. We strive to be inclusive in the way we share our business opportunities,” he added. Mohammed added that there is a need for ready talent pool with the right skills and what is more important is for them to be able to respond to changes. “Moving up the value chain with innovative solutions require changes in the way we do things. These changes need to be managed and this means providing them the motivation to adapt with proper training and upskilling support. “This is where you come in. You are the country’s and our future pool of talent. Someday you’ll have the opportunity to work with us and experience the true value of Gamuda’s Talent Building, Nation Building proposition,” he added when addressing the scholars.